I just wanted to urge you all to see Mary Scruggs' one-woman show, "Missing Man," before it ends its run at Live Bait Theater (through March 2). Here's the log line: "Missing Man is based on a cross-country motorcycle trip solo artist Mary Scruggs took with a group of Vietnam Vets to the Vietnam Memorial in Washington, D.C. 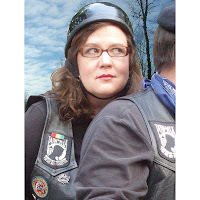 It's a story of one woman, 300 motorcycles and a lot of emotional baggage." I saw it last night and was blown away. I'd heard some of Mary's stories about the trip, but the show goes far beyond funny anecdotes. It's a great show—funny and moving, and Mary's in great form. And it's not just my take--it's one of the relatively small number of current productions that are "Jeff recommended."